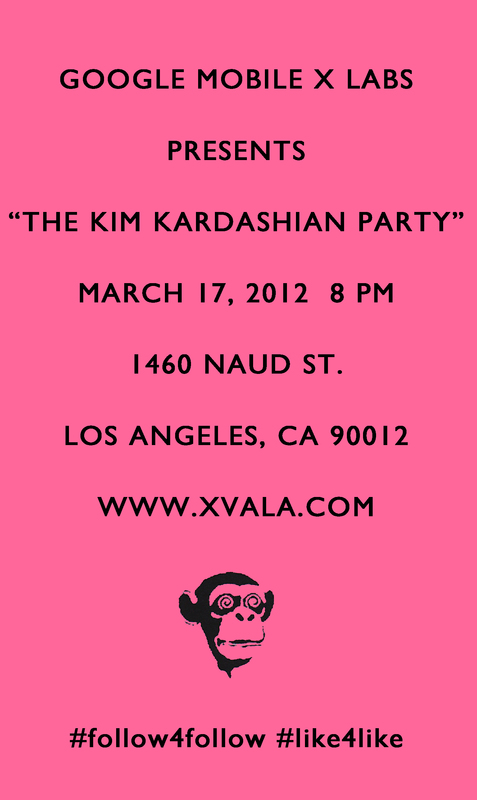 LOS ANGELES (March 12, 2012) – Fear Google artist XVALA will be exhibiting his latest collection of work created from trash found while “dumpster-diving” through the trash bins of Kim Kardashian. The Kim Kardashian Party exhibit will feature his latest sculpture of the celebrityʼs emotionlessly deflated basketball and will be held at a rooftop event in Los Angeles this weekend. “Slammed and Dunked,” a life-size fabricated sculpture of the basketball salvaged from the celebrityʼs residential trash, was primarily inspired by Kardashianʼs recent failed marriage to NBA star Kris Humphries and the questioned authenticity of their acclaimed marriage. The sculpture was created out of a ʻrecycled resinʼ formulated from remaining leftover garbage that was also collected from the Kardashiansʼ trash bin. Also, a part of the collection is candid mobile phone self-portraits of the reality star that she took for Twitter and Instagram, which are backed with aluminum, also partially recycled from her personal garbage. The Karsdashian trash sculpture is the latest installment in a series of work created from the dumpster-diving of tech icons and celebrities worldwide in order to retrieve information and material in support of XVALAʼs vision. Through this process, XVALA has become a local hero for tech junkies due to his recent coverage and success in the media for dumpster-diving Facebookʼs Mark Zuckerberg and Appleʼs Steve Jobs, who passed away a day after the release of his personal trash. XVALA is an American artist whose stated goal is to “disappear from the Internet.” His ʻFear Googleʼ sticker (first appearing in Silicon Valley and now appearing nationwide) is the first street art sticker designed for the ʻPost-PC Era.ʼ It launched in 2010, the same year as Apple’s iPad and other Post-PC devices. XVALA‘s street works, paintings, sculptures, drawings, and Internet ideas point to society’s growing inability to disconnect from the Internet.